Despite all the good stuff you hear about it, working from home can be a drag some days. There will always be those moments when you can’t get any work done. Playing with the kids seem much more enjoyable, your wife’s to-do list get’s in the way or for those with no family, working in their jammies sends slumber signals to the brain that no amount of caffeine can jam. It’s almost like you’d rather work in an office. The trouble for many solo entrepreneurs and small business operations is that renting an office can be very expensive, especially if your start-up is pretty much just that and hasn’t quite begun showing any profit. Typically office space rentals start at around $1,000/month for a tiny space in an urban downtown location. That’s a big chunk off the budget of many fledgeling businesses. However in the last three year, thousands of freelancers, solo business owners, artists and small business operators in Canada have been turning to a practice called co-working to help bring down the cost of maintaining a working space. Aside from rent that could be thousands of dollars cheaper, co-workers also benefit from something many business owners stuck on a traditional lease arrangement find hard to get – camaraderie and community. Essentially, co-working is a style of work where individuals share a working environment (an office, a loft space, a large room or a long desk). The workers don’t necessarily need to be involved in the same business, activity or project. 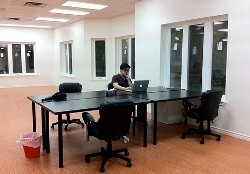 All the desk space you need at the Work Republic in Scarborough, Ont. 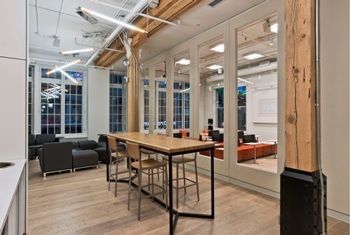 Many co-working location are comprised of a large room with desks where individuals can hook up their laptops or computers to an outlet and a high-speed Internet connections. There could be a common lounging area, a coffee or snack counter and perhaps even a room or two for conferences and special meetings. Many co-workers say the arrangement is suitable for people who want to escape the distractions of a home environment but don’t want to plunk a lot a dough for a space that they will only use from 9 to 5 or for only for the odd day. Another benefit is that co-workers are able to connect and build alliances with other co-workers that might compliment the projects they are doing. Co-work locations are frequently hubs for bar camp-type of meetings. While office spaces normally rents anywhere from a few hundred dollars to over $1,000 a month, co-working rates are very low a flexible. Some rates start as low as $8/hr per desk to about $400/month/per desk. Generally co-workers can book a space whenever the need arises. Some arrangements give guaranteed 24-hour access to their workspace, other shops close at around 10 p.m. or earlier. 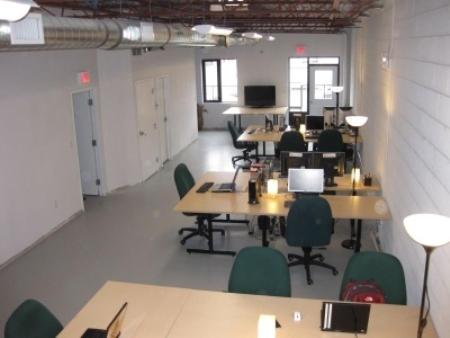 Many Canadian co-working space operators trace the trace the idea of co-working to 2005 when Brad Neuberg used the tem to describe a physical space which he first called the 9 to 5 group. He later organized a co-working site called the Hat Factory in San Francisco. There may have been some co-working arrangements existing about the same time in Canada but many locations appear to have blossomed around 2009 or 2010. I went to several co-working locations in Toronto recently to find out more about the movement. I took videos of some of the spaces available in the city and talked with their operators and clients. Check out ITBusiness.ca on Tuesday to find out how Canadian entrepreneurs are benefiting from the co-working movement and find out if co-working is for you.